For quite a while now, Tasks Jr has been my task management tool of choice. I switched to it from my own Tinderbox-based system after I decided that having access to my list from any 'net-connected system was important to me. But now I've switched again. Over time, the aesthetics of Tasks Jr's design, its limitations (which are resolved by the more advanced versions, I must admit), and the fact that a recent MySQL/PHP update at my web host caused problems made me think about finding another solution. So I've begun the great migration to Values of n's Sandy. Its integration with Twitter and the almost magical email-based interface are icing on the cake, beyond what Tasks Jr offered. The aphorism "out of sight, out of mind" could have been created with me in mind. To make the most of any system, Tasks Jr or Sandy, I need to have it constantly open and visible. With a web site, it's easy to lose the window when opening another URL, or simply absentmindedly closing a Safari window. I've tried every trick I can think of to keep my task list open and at-hand, including Dock icons, setting it as my browser home page, and even the nifty WebDesktop application. But thanks to a comment here on 43Folders, I discovered Fluid. The work of Todd Ditchendorf, Fluid allows you to create WebKit-based dedicated browsers for webapps. In other words, it makes a standalone app whose sole purpose is to connect to a specific website. This allowed me to create a Sandy application that lives in my Dock, and I don't lose my place when opening web pages or surfing with Safari. You can use Fluid with any web application of course, and there's a Fluid Icons group on Flickr where you can get images to use with the app. 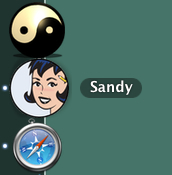 Thanks to Rael at Values of n, I uploaded a Sandy-specific icon the other day, which you see in action in the screenshot above. So far, the combination of Sandy and Fluid is working out quite well. Sandy is smart, easy to use, and reminds me of appointments via Twitter and SMS. Thanks to Fluid, my Sandy digest is omnipresent to keep me on task while at the computer. Give both of them a whirl and see if they don't work well for you, too. Gordon Meyer is a Chicago-based author of dozens of software manuals, an expert in "do it yourself" home automation (he wrote Smart Home Hacks for O'Reilly Media), and an experienced public speaker. His interests include conjuring, sociology, and humanizing technology.